Mary McCune and Corrine Joinette scored 0.40 masterpoints with a 54.3% game at Seattle Bridge Center. See full results of this game. Patti McCallum and Nick Tipton scored 0.80 masterpoints with a ★63.41%★ game at Seattle Bridge Center. See full results of this game. Beau Hovda and Cindy Glad scored 0.40 masterpoints with a 52.22% game at Seattle Bridge Center. See full results of this game. Mike Christensen and Becky Stevens scored 1.90 masterpoints with a ★62.08%★ game at Seattle Bridge Center. See full results of this game. Kathy Gilman and Nick Tipton scored 0.55 masterpoints with a 51.85% game at Seattle Bridge Center. See full results of this game. David Binney and Andrea James scored 1.43 masterpoints with a 53.45% game at Seattle Bridge Center. See full results of this game. Ray Miller and Mary McCune scored 0.72 masterpoints with a ★61.62%★ game at Seattle Bridge Center. See full results of this game. Dave Walker and Marty McCune scored 1.20 masterpoints with a 58.08% game at Seattle Bridge Center. See full results of this game. David Binney and David Walker scored 0.90 masterpoints with a 59.79% game at Alki Bridge Club. See full results of this game. 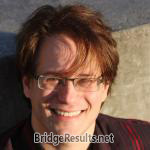 Michael Christensen and Stanford Christie scored 1.29 masterpoints with a 55.56% game at Mercer Island Bridge Club. See full results of this game. Marci Knipschield and Steven Lewis scored 0.56 masterpoints with a 55.87% game at Seattle Bridge Center. See full results of this game. Mary McCune and Cindy Glad scored 0.40 masterpoints with a 54.08% game at Seattle Bridge Center. See full results of this game. Mary McCune and Marty McCune scored 2.63 masterpoints with a ★61.99%★ game at Seattle Bridge Center. See full results of this game. Mary McCune and Corrine Joinette scored 1.75 masterpoints with a ★62.5%★ game at Seattle Bridge Center. See full results of this game. Mary McCune and Dave Walker scored 2.19 masterpoints with a 59.05% game at Seattle Bridge Center. See full results of this game. Michael Christensen and Stanford Christie scored 2.77 masterpoints with a ★64.56%★ game at Mercer Island Bridge Club. See full results of this game. Marci Knipschield and Steven Lewis scored 2.08 masterpoints with a ★60.88%★ game at Seattle Bridge Center. See full results of this game. Ray Miller and Ann Romeo scored 2.04 masterpoints with a 57.29% game at Seattle Bridge Center. See full results of this game. David Binney and Andrea James scored 1.53 masterpoints with a 54.17% game at Seattle Bridge Center. See full results of this game. Nelson Davis and Beau Hovda scored 0.80 masterpoints with a ★69.57%★ game at Seattle Bridge Center. See full results of this game. Mary McCune and Corrine Joinette scored 1.10 masterpoints with a 58.1% game at Seattle Bridge Center. See full results of this game. Cliff Feldman and Beau Hovda scored 0.24 masterpoints with a 48.15% game at Seattle Bridge Center. See full results of this game. Beau Hovda and David Binney scored 1.10 masterpoints with a ★63.55%★ game at Seattle Bridge Center. See full results of this game. Joel Fuhrman and Dave Walker scored 0.56 masterpoints with a 57.81% game at Seattle Bridge Center. See full results of this game. Henry Lortz and Mike Christensen scored 0.77 masterpoints with a 58.33% game at Seattle Bridge Center. See full results of this game. Bryan Delfs and Sue Anderson scored 0.39 masterpoints with a 54.17% game at Seattle Bridge Center. See full results of this game. Terry Chinn and Dave Walker scored 0.84 masterpoints with a 57.92% game at Seattle Bridge Center. See full results of this game. Ray Miller and Mary McCune scored 1.20 masterpoints with a 58.75% game at Seattle Bridge Center. See full results of this game. Ron Tracy and Greg Ho scored 2.19 masterpoints with a ★60.19%★ game at Alki Bridge Club. See full results of this game. David Walker and David Binney scored 0.92 masterpoints with a 56.94% game at Alki Bridge Club. See full results of this game. Harry Steiner and Elaine DeShaw scored 2.92 masterpoints with a ★64.06%★ game at Alki Bridge Club. See full results of this game. Mary McCune and Cindy Glad scored 0.80 masterpoints with a ★63.52%★ game at Seattle Bridge Center. See full results of this game. Mary McCune and Corrine Joinette scored 0.73 masterpoints with a 54.73% game at Seattle Bridge Center. See full results of this game. Terry Chinn and Dave Walker scored 0.55 masterpoints with a 57.04% game at Seattle Bridge Center. See full results of this game. Harry Steiner and Elaine DeShaw scored 0.63 masterpoints with a ★62.5%★ game at Alki Bridge Club. See full results of this game. Nick Tipton and Garry Evans scored 0.69 masterpoints with a 51.85% game at Seattle Bridge Center. See full results of this game. Terry Chinn and Steven Lewis scored 1.30 masterpoints with a ★63.48%★ game at Seattle Bridge Center. See full results of this game. Mary McCune and Corrine Joinette scored 0.50 masterpoints with a 53.29% game at Seattle Bridge Center. See full results of this game.